Wine Country : Argentina & Chile | Fully customized itineraries to Europe, Central and South America. Your tour, your way. Explore the best of South American Wine Country during this 11-day tour through Argentina and Chile. 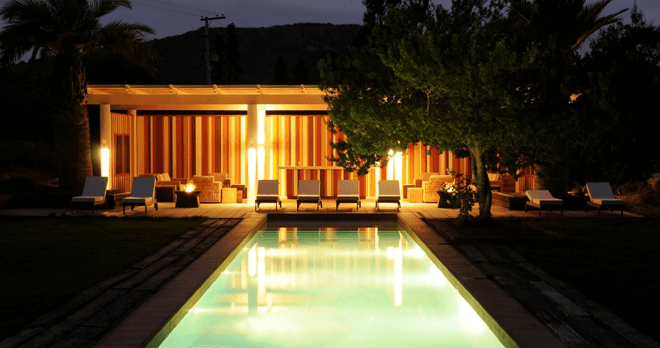 Begin your journey with two nights at LA CASONA at Matetic, a boutique winery in the Casablanca Valley of Chile. Discover the luxury at the base of the majestic Andes mountains at The Vines Resort & Spa and end your journey in the cosmopolitan city of Buenos Aires. * Specific wineries visited are subject to availability. Deluxe option available featuring Casa Antucura Wine Hotel, Uco Valley and Mendoza available. TORONTO – SANTIAGO Depart from Toronto to Santiago on an overnight flight. SANTIAGO – CASABLANCA VALLEY Arrival in Santiago. 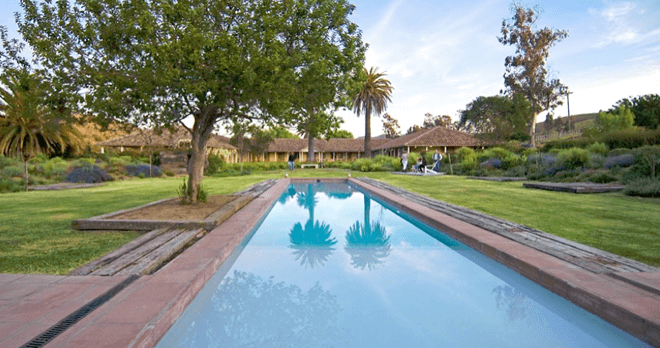 Welcome and transfer to the Casablanca Valley and check into LA CASONA at Matetic Vineyards, famous for their organic wines. With its rustic charm, superb accommodations and well-maintained gardens, it is the perfect setting to relax by the pool with a glass of wine in hand. Enjoy a welcome cocktail upon arrival followed by a full presentation of Rosario Valley by their specialized guide at El Emporio. Dinner and overnight. 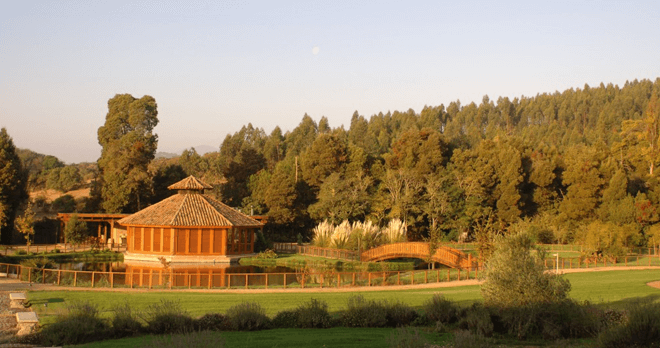 CASABLANCA VALLEY After your buffet breakfast, enjoy an outdoor guided excursion such as horseback riding, biking or hiking. Lunch includes mini dishes with wine parings. 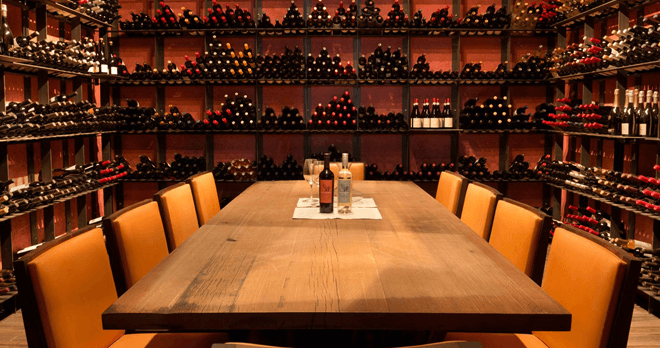 Tour the cellar, taste four premium wines and take a mini-course in making your own pisco sour. Enjoy dinner and overnight at the winery. 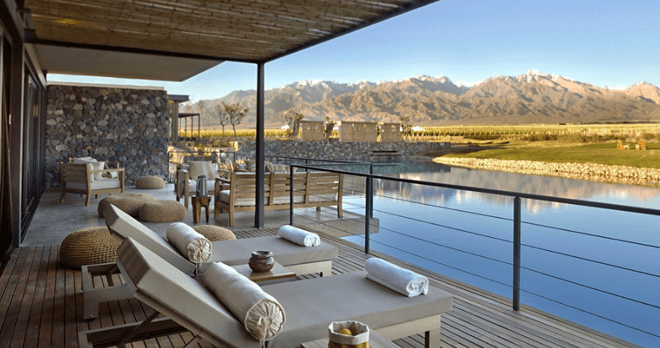 CASABLANCA VALLEY – SANTIAGO – MENDOZA After a buffet breakfast, drive to Santiago. Enjoy a private city tour of Santiago featuring the Palacio de la Moneda, which is the nerve center of the Chilean government and a stunning example of neoclassical architecture. See the Plaza de Armas and the bustling Mercado Central. Ascend to the top of the city for dramatic panoramic views from the beautifully landscaped Cerro Santa Lucia. Transfer to the airport for your flight to Mendoza, Argentina, famous for olive oil production and wine making. Arrival, welcome and transfer to The Vines Resort and Spa and check-in at one of their beautiful one-bedroom villas. 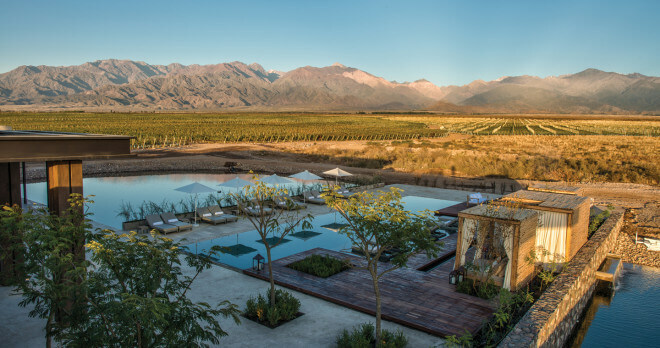 Nestled at the base of the majestic Andes in Mendoza’s prestigious Uco Valley, sip the finest wines, explore the glorious terrain, or ride off into the sunset. Feast on the exquisite cuisine of famed chef, Francis Mallmann, and his signature open-flame cooking at Siete Fuegos. Work side-by-side with world-renowned consulting wine maker Santiago Achaval and his expert team to make your custom small-batch wine. MENDOZA Breakfast at the resort. Relax in the Lodge. With its cozy indoor fireplace, cocktail bar and wine cellar, it is a natural gathering place to catch the most beautiful moments of the day and savor new experiences. Choose to horseback ride; gallop through the vineyards into the rugged countryside or in the mountains of nearby Manzano Historico, guided by authentic Argentine gauchos. MENDOZA Breakfast at the resort. 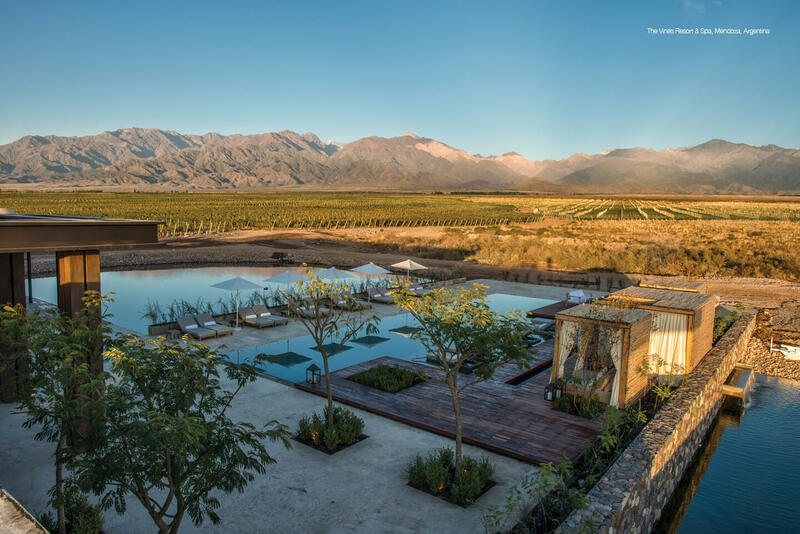 Spend your day at leisure, perhaps fly fishing alongside locals or take an excursion to Mendoza’s Uco Valley with hundreds of wineries and limitless outdoor activities. With over 300 days of sunshine a year, the outer regions beckon through rugged mountains, sprawling countryside and flourishing vineyards. MENDOZA – BUENOS AIRES After breakfast, transfer to the airport for your flight to Buenos Aires, then to your hotel. Spend your afternoon at leisure to explore this cosmopolitan city. Enjoy dinner and an authentic Tango show at one of the city’s most renowned clubs. 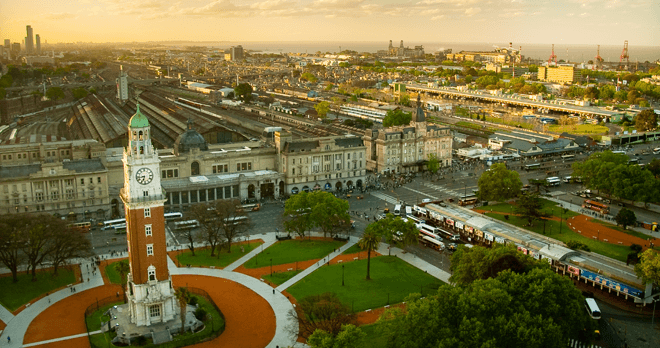 BUENOS AIRES After breakfast, take a half-day private city tour accompanied by your own guide to discover Buenos Aires including Plaza de Mayo, the historic Cabildo, Casa Rosada, Congress Palace, the quaint La Boca district and La Recoleta Cemetery. BUENOS AIRES Explore the city at your own pace. Visit one of the many European inspired gardens throughout the city. Optional tour to an Argentinean ranch for authentic Gaucho culture is available to add to your package. BUENOS AIRES –TORONTO After breakfast, transfer to the airport for your homebound flight. TORONTO Morning arrival in Toronto.